Ace Hoffman's Nuclear Failures Reports: Recent AP news item continues the fiction that the nuclear waste problem can be solved. Recent AP news item continues the fiction that the nuclear waste problem can be solved. There are several inaccuracies in Dave Gram's recent AP article on nuclear waste funding (the full article is shown below (bottom)). Many of the "mistakes" are seen regularly in news articles written by pro-nuclear "science" writers who accept the basic (erroneous) idea that the world needs nuclear power -- so somehow, we are going to find a way to deal with the problems it causes. (1) "It was not envisioned they [ratepayers] also would have to pay for indefinite storage of spent fuel on the roughly 100 nuclear plant sites around the country." It certainly was obvious that someone would have to pay for it. The problem of storing nuclear waste indefinitely was described decades ago as "intractable." Anyone could have done the math and seen that there could never be enough storage space on earth, or safe enough storage locations, for nuclear power to be practical or economical. Ionizing radiation destroys ANY chemical bond that exists in nature. Therefore it can (and will) destroy ANY container you put it in. 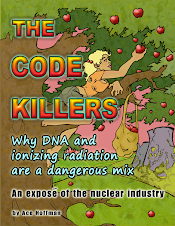 Ionizing radiation destroys materials: steel alloys, weld joints, molecular structures (including DNA strands) at the atomic level, and even at the sub-atomic level. Radiation accelerates embrittlement, resulting in cracks, leaks, and environmental damage. This was all known more than half a century ago (see quote from a 1979 NYTimes article (below, top)). (2) "Nuclear industry spokespeople, government officials and industry critics agree the retirement fund raids have been triggered by the failure to date of the U.S. Department of Energy to open a permanent disposal site for spent nuclear fuel. " Perhaps they say that, but it is not the whole truth. The U.S. DOE's failure was due to the fact that Yucca Mountain, like every other site on earth, is not an appropriate place to store nuclear waste. For one thing, Yucca Mountain is riddled with cracks that water can seep through. For another, it's in a volcanically-active area. And sometimes, when it rains it pours there -- witness the recent Beatty, Nevada fire that burst out due to water seepage at a long-closed low-level nuclear waste dump a few miles away from the proposed Yucca Mountain site. (3) "For years, the government had been planning a disposal site at Nevada's Yucca Mountain, but that plan has been scuttled by a lack of funding from Congress." Again, this is only part of the whole situation. The plan was delayed for more than two decades after problems first started to arise. After 30 years and about as many billions of dollars, Congress finally decided to let all the scientists (10,000+) go do something more productive somewhere else. By the time Congress canceled funding, probably 98% of the Yucca Mountain scientists had little or nothing to do anyway. But a small % of the scientists were stuck on difficult problems, such as designing huge, heavy titanium drip shields to try to get around the water intrusion problem for a few hundred years. Another small percentage had problems for which there were simply no good (or half-good) solutions. Those scientists were instead busily trying to calculate the likelihood of unstoppable catastrophic events (such as earthquakes and volcanoes), and had to try to prove those events weren't very frequent. Proving that...proved very difficult indeed! One more factor caused the Yucca Mountain project to be all but abandoned: The nation unwittingly accepted an alternative solution that is relatively cheap to start with, but can't last very long, and is vulnerable to terrorist attacks and numerous environmental events -- if it doesn't manage to fall apart all by itself first: Dry cask storage. (4) "Entergy Corp., closed the plant at the end of last year because it was becoming less competitive against electricity generated with cheap natural gas." Actually, natural gas is "cheap" because renewables are even cheaper, so natural gas has to be relatively cheap to compete (it could be even cheaper, but doesn't have to be to find a market). More importantly, even cheap, inadequate solutions to the problem of nuclear waste disposal are not being included in nuclear power plant calculations of their so-called "operating costs." Nor are cancers in the community (now confirmed by several studies). Nor is the shared cost (that all nuclear power plants globally should be paying) of all previous radiation releases: Chernobyl, Fukushima, Santa Susana, Three Mile Island, SL-1 and all the other accidents, large and small, that have happened (plus weapons releases, NASA accidents, hospital waste and so on). The toll on human life from Chernobyl alone is probably already over a million people dead (a number supported by a meta-analysis of tens of thousands of individual studies conducted in Russia after the event). (5) "The spent fuel bottleneck leaves closed and soon-to-close nuclear plants with the prospect that for the indefinite future, they will look like the site of the former Maine Yankee plant." Why only closed and soon-to-close nuclear power plants? All nuclear power plants should be looking at these sorts of problems and costs. If the energy users (customers) had to fully pay for all future nuclear waste storage of the waste generated by their own electricity usage, customers would demand immediate closure because the price would be sky-high. Every dry cask is a catastrophe just waiting to happen, and the fewer any one site is left with, the better. Dry casks cannot and will not be properly inspected. Dry casks can be cracking from the inside out OR the outside in. The first sign of a crack could be a catastrophic loss of integrity of the entire containment system. Cracks can go from microscopic to through-wall in a matter of months -- or even mere moments -- if the stress on the area with the crack is in the right direction. Welds near support structures are, of course particularly vulnerable and particularly hard -- or impossible -- to inspect. There are now over 2,200 dry casks in America, and enough spent nuclear fuel for more than 10,000. That's a lot of chances for a catastrophic accident somewhere. It's time to stop making more nuclear waste. There is no such thing as economical -- or safe -- nuclear power. "An environmental "watchdog" organization has accused the United Nations Environment Program of suppressing its own report on possible health hazards in nuclear energy and the dangers of accident at nuclear-powered installations. "The [UNEP] report concedes that no adequate permanent disposal method has been devised for highly radioactive wastes, which 'will remain active over immense time scales and, unless continuously isolated, will present dangers to our remote descendants.' It estimates that it would take 10 to 20 years just to determine the feasibility of some 'promising ideas' for disposal." MONTPELIER, Vt. (AP) ­ With a federal promise to take highly radioactive spent fuel from nuclear plants still unfulfilled, closed reactors are dipping into funds set aside for their eventual dismantling to build waste storage on-site, raising questions about whether there will be enough money when the time comes. It violates Nuclear Regulatory Commission rules for the plants to take money from their decommissioning trust funds to pay for building the concrete pads and rows of concrete and steel casks where waste is stored after it is cooled in special storage pools. But the NRC is granting exemptions from those rules every time it is asked. "All of the plants that have permanently shut down in recent years have sought, and been approved for, the use of decommissioning funds for spent fuel storage costs," NRC spokesman Neil Sheehan wrote in an email in response to questions from The Associated Press this past week. These include the Kewaunee plant in Wisconsin, San Onofre 1 and 2 in California, Crystal River 3 in Florida, and Vermont Yankee in Vernon, in Vermont's southeast corner, which closed at the end of last year. The Zion 1 and 2 reactors in Illinois, which shut down in the late 1990s, had gotten a similar OK to use decommissioning money for spent fuel storage, Sheehan said. Ratepayers chipped in during nuclear plants' lives to set aside the money it would take eventually to tear down reactors, remove their radioactive components and restore the sites. It was not envisioned they also would have to pay for indefinite storage of spent fuel on the roughly 100 nuclear plant sites around the country. And long-term, on-site storage of nuclear waste is a bad idea, said Arnold Gundersen, a former nuclear industry executive turned consultant who frequently criticizes the industry. "You build power plants near water because you have to cool them, and you build nuclear waste storage sites away from water" because of the threat of radioactive materials reaching it, Gundersen said. "It would be much better to get the stuff underground where terrorists couldn't fly a plane into it," he said. Nuclear industry spokespeople, government officials and industry critics agree the retirement fund raids have been triggered by the failure to date of the U.S. Department of Energy to open a permanent disposal site for spent nuclear fuel. For years, the government had been planning a disposal site at Nevada's Yucca Mountain, but that plan has been scuttled by a lack of funding from Congress. That has left reactors redesigning the racks in their spent fuel pools to accommodate more of the waste and expanding into "dry cask" storage, both of which Vermont Yankee did in the years before its owner, Entergy Corp., closed the plant at the end of last year because it was becoming less competitive against electricity generated with cheap natural gas. The spent fuel bottleneck leaves closed and soon-to-close nuclear plants with the prospect that for the indefinite future, they will look like the site of the former Maine Yankee plant. That plant was permanently shut down in 1997, nearly two decades ago. Today, the reactor is gone, but the site in the coastal town of Wiscasset still features 60 steel canisters encased in concrete that contain the 550 metric tons of spent fuel the plant generated in its 25-year life. The site is guarded 24 hours a day, 7 days a week. Vermont Yankee's decommissioning fund already is short enough ­ it contains about half the estimated $1.24 billion cost of dismantling the reactor, removing the waste and restoring the site ­ that the plant plans to follow an NRC-allowed procedure called "SAFSTOR," in which the closed reactor is mothballed for up to 60 years in hopes the fund will grow enough to cover the cost. Vermont Yankee spokesman Martin Cohn said Entergy had taken out a $145 million line of credit to cover capital costs of building its on-site waste storage. But he said the company is planning for $225 million in security and other operating expenses after the spent fuel is in storage. Gundersen said Vermont is alone among states in that it is trying to limit raids on the decommissioning fund. This month, Vermont won a ruling from an NRC board that Entergy would have to keep it informed of withdrawals from the fund for specific expenses. Cohn argued that anyone concerned about the costs of on-site waste storage and how they're being paid should not focus their ire on the industry, NRC or even the Department of Energy. Rather, it is the Congress that has failed to fulfill its decades-old promise that the federal government will take highly radioactive spent fuel off the hands of nuclear plant operators. Welcome to Las Vegas. You're under arrest.